SUPPORT TENNIS: Win Courtside Seats! 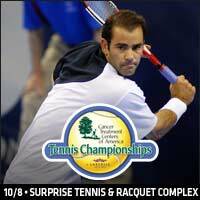 An all-star Champions Series lineup of Pete Sampras, Jim Courier, Mats Wilander, and Michael Chang will head to Surprise, AZ on Saturday, October 8 for the Cancer Treatment Centers of America Championships Presented by Sanderson Volvo at the Surprise Recreation Campus Tennis & Racquet Complex. The newly reformatted Champions Series travels through 12 US cities this fall, with star-filled one-night tournaments in each venue. Come see the legends in this historic night of tennis – there will be 3 matches: two semifinals followed by the Championship match. Its high-stakes tennis with $1 million dollars in series bonus pool money on the line. And if that isn’t enough tennis for you, you won’t want to miss it when tennis greats, and U.S. Open Rivals, Chris Evert and Tracy Austin are reunited on the tennis court at the Surprise Tennis and Racquet Complex on Sunday, October 9. Michael Chang and Jim Courier will battle it out in a singles match followed by an epic mixed doubles match between the former American stars. "We are thrilled to reunite seven legends who have won an astonishing 52 Grand Slam singles titles among them," said Jon Venison, Founding Partner of the Champions Series. "This is the greatest generation of champions ever assembled and an unprecedented opportunity for sports fans around the U.S. to reconnect with them." "Competing against my friends and foes in front of fans across the country is going to get my adrenaline pumping," Courier said. "The player line-up and format of the circuit is ideal for me and my peers to quench our competitive thirst, while showcasing tennis to many cities that lack pro tennis events. May the best man win." The Champions Series is a tennis circuit for champion tennis players over the age of 30, created in 2005 by InsideOut Sports + Entertainment, the New York based firm which is co-owned and operated by former SFX executive Jon Venison and former world No. 1 Jim Courier. Former World No. 1 Tracy Austin will hold a special clinic on Saturday October 8 from 4-5:30 pm at the Fairmont Scottsdale Princess. Join Tracy and the Fairmont teaching staff for a fun, energetic and instructional clinic. Whether this is your first time hitting a tennis ball or you have competed at a tournament level, Tracy's goal with everyone is to make it fun-filled and educational while learning the same tips and techinques that have brought her personal success in her 30+ year career. Contact the Fairmont Princess pro shop at (480) 585-2733 to reserve your place. The cost is $70/person for Princess members and $100 for non-member guests. Click HERE for more info. Purchase now and take advantage of an exclusive USTA member discount (Password: USTASW). Group discounts and special VIP packages with limited premium seating are also available. 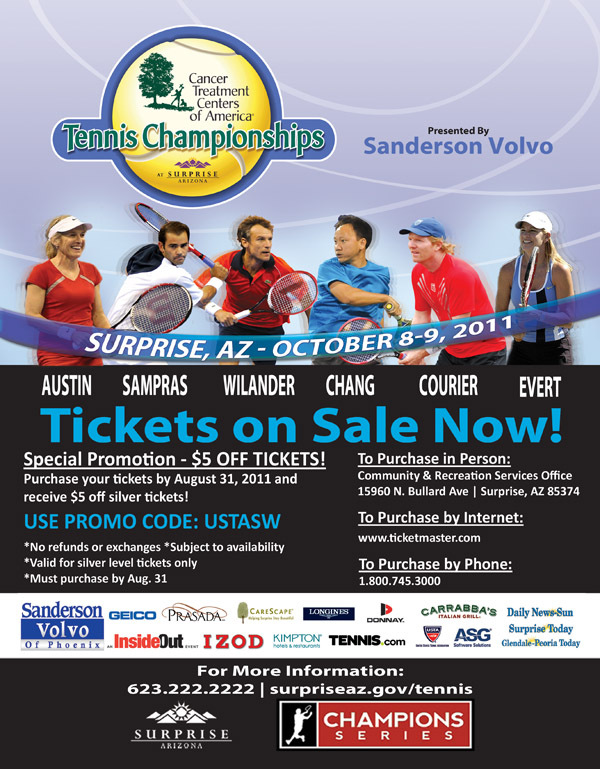 For more information and to purchase tickets, visit www.ChampionsSeriesTennis.com or www.surpriseaz.gov/tennis. For information, call the Surprise box office at 623.222.2222. 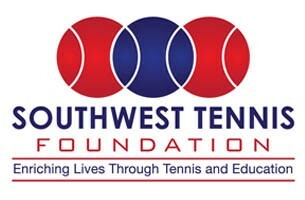 The Southwest Tennis Foundation is also giving out a box seat and hospitality package to one lucky winner. Sit courtside and get to meet the players before they take to the court on Oct. 8. For a small $5 donation, you will be entered into a drawing to win this sweet VIP package! Click HERE for more ino.